Our senses can bring us closer to some of life’s greatest gifts—whether it’s hearing our loved ones laugh, or watching their faces light up when they smile. But for one man, Nathaniel Jackson, losing his senses made him lose a sense of himself, until he received help from the Hearing Aid Project. Nathaniel was born with hearing loss, but no one knew. As a result, he was punished for being ‘disobedient.” The truth was, he could not hear. His mother took him to the audiologist and he was given hearing aids. But after being picked on relentlessly by siblings and schoolmates, he stopped wearing them. In order to get by without them, he began reading lips and sitting in front of the classroom. In addition to living with hearing loss, Nathaniel lost his sight as an adult. He was diagnosed with retinitis pigmentosa known as R.P., which does not have a cure or treatment options. Nathaniel was not ready, but his condition slowly caught up to him. This is ultimately what happens with Usher Syndrome (a condition characterized by partial or total hearing loss and vision loss that worsens over time). 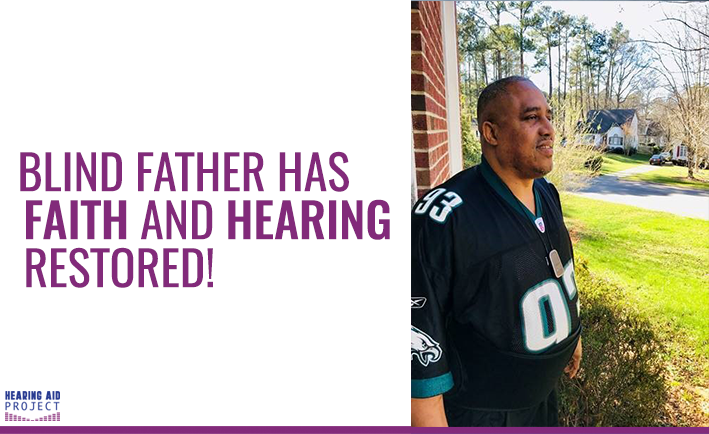 Although he will never be able to see again, Nathaniel’s son helped him find the Hearing Aid Project, which has allowed him to hear the voices of his children. Nathaniel says that hearing laughter, his children and the word of God has restored his smile and joy. Every $500 raised provides someone in need just like Nathaniel with a new chance to find happiness. Will you help us continue making a difference in the lives of men and woman all over the country? Create a personal fundraiser, or make a donation. Big or small, your gifts add up to so much more! Team up with the Hearing Aid Project! Download this poster to help others hear!